"I've got nothing now. I've thrown it all away." Thinking back, I must have first seen Overlord about four years after it was first released in the UK, but I can't for the life of me remember exactly when or where. But I do remember my reaction to it. I was stunned. It wasn't just the sometimes seamless marrying of archive footage to freshly shot material – impressive though that is – it was the sheer poetry of the piece. Oh I know that drawing comparisons between two vastly different media can sound pretentious or like an attempt to excuse an absent or fragmented narrative, but no other term seemed to better capture this extraordinary film's unique handling of its subject matter. And years later, having seen the film for the first time in I don't know how long, I have no trouble standing by that claim. In those pre-DVD, pre-internet days, it was hard for an ordinary working stiff to find out much about the film's director, Stuart Cooper, or to see anything else he'd made. It was years before I saw an interview with him and cannot describe the shock I got at discovering that he was American. This is not the emergence of some previously buried xenophobia, it's just that Overlord is so...well...British – I'd even risk saying English – that it seemed inconceivable it could actually be the work of anyone but a born and bred Brit. And I'm not talking about the story itself, which could easily be adapted to accommodate an American abroad, but the fine detail, the dialogue and delivery, the so-real exchanges between soldiers, the small hesitations and uncertainties of the characters, and the overriding sense of restraint in the handling of an intimate story in an almost apocalyptic setting. I wasn't the only one so smitten. A shared love of the film was one of the things that contributed to the strongest friendship I ever had, while Los Angeles film obsessive Jerry Harvey was so struck by it that he programmed a season of work by this relatively unknown filmmaker on the famed Z Channel, with Overlord as its centrepiece. Originally planned as a documentary to mark the thirtieth anniversary of D-Day landings, the project was instigated by the Imperial War Museum, whose extensive cooperation and assistance throughout the production was to prove essential to Cooper's approach. Cooper and co-screenwriter Christopher Hudson were also given access to letters and diaries of soldiers who took part in the D-Day landings, which they drew on extensively in the construction of their script. On paper the story is a simple one. It's 1944, and innocent, 20-year-old Tom has been called up to serve his country and in the course of his basic training becomes friends with fellow recruit Arthur and the more experienced Jack. 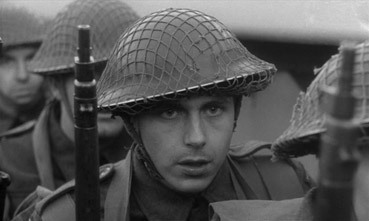 As their company trains for what will eventually become the D-Day landings, all three start to have doubts about the upcoming invasion and Tom begins experiencing premonitions of his own death, hauntingly visualised as a combination of Robert Capa's iconic Spanish civil war photograph Death of a Loyalist Soldier and Charles Bronson's slowed-down, blurred memory of a childhood trauma from Once Upon a Time in the West. It's Tom's fatalism that sets him apart from any number of innocents sent to war in movies before and since, as he not only firmly believes he will die but calmly accepts its inevitability. This gives rise to a semi-comic off-screen moment when we learn that he has asked his superiors for compassionate leave, which he plans to use to visit his family to console them for a death that is going to happen rather than one that has already occurred. A more tellingly representation of Tom's conviction lies with the fate of a letter he has written to his parents that he is forbidden to carry on the invasion itself and required to send home or burn – in the light of his belief, that he chooses the latter can't help but seem like a symbolic cremation. Other pointers to his possible demise emerge without ever feeling forced – the requirement that he name his next of kin and fill out a 'will form', the tumble he takes on manoeuvres that is shot in the same manner as his premonition, the memory (or perhaps fantasy?) of his brief time with a girl he meets at a dance (in a wonderfully naturalistic exchange), where she uses him to demonstrate how the dead are prepared for burial. Overlord is not an anti-war film per se, but one that poignantly communicates the sense of wasted life that comes with sending young men on mass into an armed conflict of this scale. "Cannon fodder, that's what we are," muses Arthur at one point, vocalising the fears of his comrades, in spite of the fact that none have yet seen a shot fired in anger. Their disillusionment comes largely from their role as tiny cogs in a giant and faceless machine, one in which the mechanics of war are far more visible than the people that drive it and die at its hands. This is extended to the editing of the archive material, where the night-time bombing of German cities, shown as hypnotically abstract firework display, is intercut with brief but perfectly chosen footage of the results of such destruction. It's a familiar technique used here with commendable restraint – the blows with which Cooper and his editor Jonathan Gili (later a documentary filmmaker in his own right) deliver their message may be small, but are driven home with persuasive precision. The blending of archive footage with newly shot material is crucial to Overlord's structure, tone and intentions, and never for a moment does it smack of gimmickry. 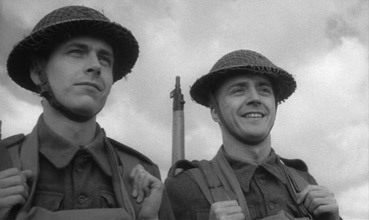 A trained eye will have little trouble differentiating the two in the early stages (the more fidgety camera style on the documentary material is a key pointer), but as the film progresses it is only the scale of the content – even with MoD assistance it seems unlikely Cooper would have been able to re-stage the rehearsals for the Normandy landings on Poole beach – that give the game away. The archive footage is often fascinating in itself, the result of an estimated three-thousand hours that Cooper spent sifting through material in the Imperial War Museum Film and Photo Archive. Considerable credit for the integration of new with old belongs to cinematographer John Alcott, probably most famous for his work with Stanley Kubrick on such films as A Clockwork Orange, Barry Lyndon and The Shining. 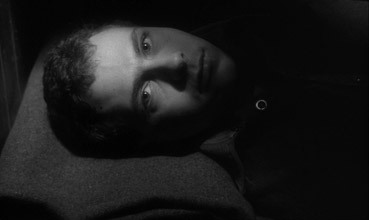 His position on one of the top rungs of the cinematography ladder is due in no small part to his innovative work with in lighting shots using a single primary source (if there's one window in the room then that, Alcott believed, is where the light should come from) and 'practicals', light sources that are visible within the frame and logical to the location (hurricane lamps in March or Die, candles in Barry Lyndon). In Overlord Alcott went beyond simply using older monochrome film stock, employing a complex (but invisible) use of filters and hunting down two uncoated Zeiss lenses of the sort that would have been used to shoot the material his own footage was required to match. The results of this work might be too subtle for VHS, but on digitally remastered DVD they can be fully appreciated, although even within this visual authenticity there are moments that stand out for their beauty. The wide shot that precede's Tom and Arthur's pause for a cigarette in dense undergrowth recalls the luminescence of nature of Kuroda Kiyomi's work on Onibaba, while the slow pull back from Tom as he writes his last letter home in a gorgeously backlit woodland setting has a similar painterly quality to Alcott's Oscar-winning work on Barry Lyndon. (Ironically, at an interview with the great man that I attended at the National Film Theatre many years ago, Alcott claimed to dislike black-and-white, regarding it as an accidental stepping stone to colour.) There's even a shot that prefigures the memorable mobile camerawork on Kubrick's Full Metal Jacket – which Alcott was unable to shoot due to other commitments – in which the camera follows a drill sergeant as he walks up and down the barracks, barking out commands to his attention-stood soldiers. Overlord is one of those films that for me gets everything right, but my relation with it is both long-standing and personal, so how can (and why the hell should) I be objective here? The performances are winningly natural – Brian Stirner's quiet and apprehensive Tom, Nicholas Ball's chirpy Arthur and Julie Neesam's dance date deserve a special mention – and Alcott's cinematography, Gili's editing and Paul Glass's emotive score are all superb. And Cooper's handling of a story that ends almost at the very moment Saving Private Ryan begins still feels thrillingly fresh thirty-three years on. There's so much else to admire and discuss here: the extraordinary equipment on display in the Normandy landing rehearsals (everyone remembers the big panjandrum, a giant Catherine wheel-like device designed to roll onto shore and deliver a bomb into the enemy's lap but that had a habit of randomly redirecting itself, sometimes back at those who had launched it); the decision to show Tom's encounters with officers (one of whose voices is supplied by an uncredited David Warner) almost exclusively in their point of view; a late film process shot that is as haunting as it is visually striking; and a lot more besides. For the way it tells a small story without excluding the big picture, for its uniquely brilliant use of remarkable archive footage, for its superb camerawork, editing, music and direction, and most of all for its poignant humanity, Overlord is, for this humble (re-) viewer, quite simply one of the finest war films ever made. Restored and remastered, the 1.66:1 anamorphic transfer here is a delight to behold. The very slight softness to the picture is intentional and the result of Alcott's work to match the new footage to the old. There's a little jitter on a couple of shots (including one of Cooper's) and there is inevitably some minor damage still visible on some of the archive material, but the contrast is just right, the black levels bang-on and the detail consistently fine. The biggest surprise is just how good some of the archive footage looks, at times matching the new material in every respect. The Dolby mono 2.0 soundtrack is as clean as the picture, with no sign of hiss or crackle. The dynamic range is inevitably limited, but this is appropriate to the visual style. A busy and consistently interesting commentary that touches on all aspects of the production, including the involvement of the Imperial War Museum and its staff, Paul Glass's score, working with and training the actors, the construction of the screenplay, the beauty of the archive material and a whole lot more. Cooper has a special affection for John Alcott, who he describes as his mentor, and has a nice story about meeting Kubrick, who naturally wanted to know all the technical details about how Overlord was made. The present keeper of the Imperial War Museum Film and Photo Archive outlines the origin and function of the Museum and looks back at the production of Overlord, when he was, in his own words, "a humble film cataloguer." A very useful and interesting 16 minutes in which Smither reveals the Film Archive's view of Cooper's handling of their material and selects his favourite sequences. Another engaging look back at the making of the film, this time by a now familiar face on British TV who was then making his film debut. Inevitably he discusses his character and the making of the film, but also has an amusing story about just why he and fellow actor Brian Stirner were running so fast in one shot. A camera operator who worked for many years with Alcott, whom he describes as being like a father to him, remembers the great man and details some of his techniques. Lovely stuff for those of us currently involved in lighting camerawork – I've already starting experimenting with one of the O'Neons descriptions. Another (unnamed) member of the Imperial War Museum Film and Photo Archive takes us on a tour of the facilities that Cooper would have used and explains the process involved in viewing and selecting material for use. He also shows us some of the film cameras that would have been used by cameramen in WW2. A short rolling animated gallery of stills, set to music, rather nicely done. Ah, the nostalgia at seeing a BBFC front card identifying this as a U trailer for an AA film. If that means nothing to you then sorry, I've no intention of explaining it. A pretty good sell that hasn't dated as much as many other trailers from this period. Overlord was on my (and the site's) DVD wish list for some time, and Criterion's US release last year had me whooping with joy. No sooner had I started to grumble that it took an American company to give this extraordinary British film (directed by an American I know, but one resident in the UK) the DVD release it deserved than Metrodome came along and announced their own, impressive edition. If you want to make comparisons with the Criterion disc then follow the link here, but although the Criterion has the edge on the variety and quality of its extra features, I still have no hesitation in recommending this disc, whose transfer is effectively the same as that on the Criterion DVD and whose extra features compliment the film well.